Answering4u makes the McCandless brother happy campers! Two brothers who established Kiravans, a successful business designing and producing professional parts for the specialised campervan conversions market, discover that the partnership with Answering4u gives them more time to focus on developing their business. 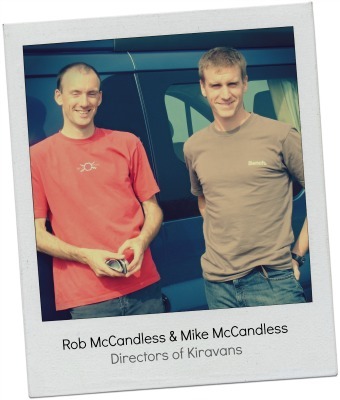 When Rob and Mike McCandless set up Kiravans they wanted to create a business which would enable them to earn a living doing something they both loved, as well as giving them time to spend with their young families and to pursue outside interests. To achieve this perfect balance they needed to have sufficiently low overheads to respond flexibly to the demands of life and work. They also run the business from their respective homes at opposite ends of the country – Rob in Yorkshire and Mike in Devon – so they wanted an efficient method of keeping on top of enquiries. Call outsourcing was the solution – and Answering4u has provided the perfect partnership. 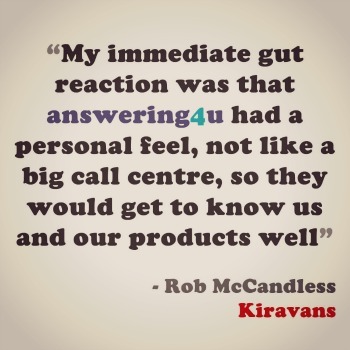 Kiravans, a mail order supplier to the VW T5 campervan conversion trade and to private VW campervan converters, was already using a company to answer phone calls and take messages, but Rob and Mike were still spending a lot of time dealing with queries. “We wanted to find a company which would become an extension of Kiravans and do more than just take messages for us,” said Rob. To help the team understand the specialist world of van conversions, Rob visited Answering4u on two occasions with his VW campervan. These hands-on training sessions provided a valuable insight into how Kiravans operated and the logistics of modifying a van using the parts they sell. Answering4u set up regular account meetings with Kiravans, backed up by weekly reports, to ensure that they keep up to speed with any changes and developments. Rob has nothing but praise for the strong working relationship that Answering4u has developed with Kiravans and is confident in the team’s ability to use their initiative to keep his customers satisfied. In fact, the outsourcing model has been such a success that the brothers plan to increase the working partnership, with Answering4u handling more aspects of the business. They firmly believe that the rapport which has already formed between the two companies will continue to grow and will be an integral part of Kiravans business operation going forwards.